Remember that movie Pay It Forward? It starred Kevin Spacey, Haley Joel Osment and Helen Hunt. A young boy wants to make the world a better place. It starts with one person doing a good (or great) deed for someone. Then that person does the same thing for three others. They “pay it forward” and the world is exponentially bettered. On Mother’s Day, why not pay it backward? One of the Hebrew biblical words for womb is “r-ch-m.” The word for compassion is “r-ch-m-m”—the addition of one consonant. Some scholars posit that the word for compassion comes from the word for womb. Think about that for a second: When an ancient language was emerging, the womb was the inspiration for how we might conceive of compassion. The womb was the first place we experienced compassion. A home, acceptance, shelter. Through no merit of our own. But simply because we existed. There is a mother-honouring (and womb-honouring) symmetry in returning compassion to the one who carried us. Pay it backward. Return compassion to mom. Moms have it hard. In a book called All Joy And No Fun: The Paradox of Modern Parenting (2014), Jennifer Senior chronicles the massive shifts in how parenting has been approached since World War Two. It’s confusing out there; the landscape has changed. Then, mix in the challenges of separation, divorce and re-marriage and the (re)negotiation of roles. Or the Washington Post headline that said 1 in 10 children now lives with their grandparents. Things are evolving. And that can breed anxiety. And frustration. And it’s easy to blame mom. After all, everyone has their own share of messed-up-ness and it can give self-satisfaction to point fingers. I know there is real hurt in some relationships—real misdeeds. And I don’t excuse that. But in a wide sense, I think we need to give this a serious think. Maybe Mother’s Day should be about paying it backward? Extending a show of compassion back to the one who wombed us. I’m intentionally not giving specific ideas. You need to think it through based on the situation and personalities in your own life. And if your mother isn’t alive? Why not show compassion to her memory? A spirit of forgiveness or acceptance? It may even give you greater liberty. Release you. In my undergrad psychology textbook there were details of a harsh experiment. There was a long box with an electric grill in the middle. In one end was a mother rat. In the other end, on the other side of the grill, was the mother rat’s young. The voltage of the grill was increased. The mother went to her young, was burned, and put back. Voltage higher. Same thing. This repeated until the mother rat died. She burned herself to death to get to her young. A mother’s instinct, her care, is often difficult and self-sacrificing. We’re all flawed. You know you’re flawed too, right? 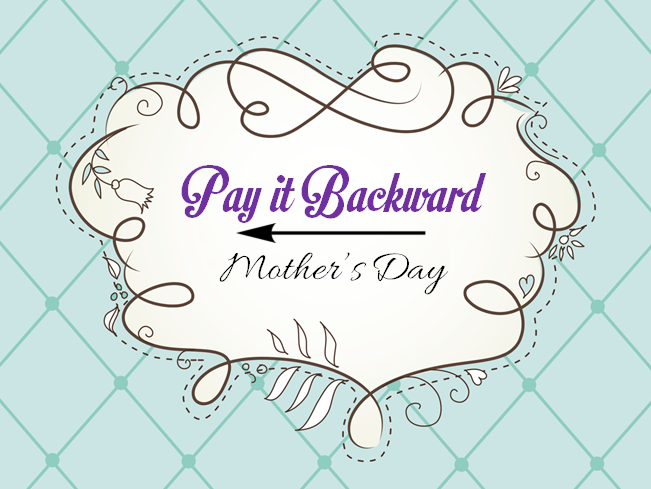 Why not pay it backward this mother’s day? Next Post: Is Anxiety Taking Over Society? Or You?